Health officials in the state of Kerala, India, report that nine people lost their lives in confirmed and suspected case of the emerging Nipah virus. 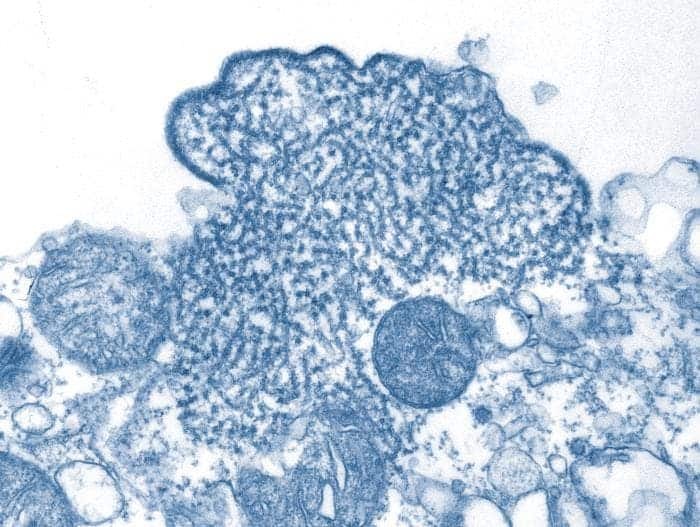 Transmission electron micrograph (TEM) showing a number of Nipah virus virions isolated from a patient’s cerebrospinal fluid. Image credits CDC / C. S. Goldsmith, P. E. Rollin. Three victims have tested positive for the virus in the past two weeks. The results from the other six are expected later today. A further twenty-five people have been hospitalized with symptoms indicative of the same infection in Kozhikode, Kerala. Nipah is one of the viruses on the list of the most dangerous viral threats, candidates for a major outbreak, published by the WHO — in fact, it was at the top of the list. It got there by virtue of two characteristics: Nipah can be transmitted to humans from animal hosts, and there is no current treatment against it. Nipah has a mortality rate of 70%. Fruit bats are currently considered to be one of the most prolific carriers and spreaders of the virus. Local authorities reported finding mangoes bitten by bats in the home of three suspected Nipah victims. Furthermore, Kerala’s health secretary Rajeev Sadanandan told the BBC that a nurse who treated the patients had also died. However, doctors are yet to confirm if she had contracted the Nipah virus, The Indian Express adds. The first time we had seen the Nipah virus (NiV) was during a 1999 outbreak of encephalitis and respiratory illness in Malaysia and Singapore. The outbreak centered around pig farmers and other people in close contact with pigs, suggesting the animals were helping spread the disease. More than a million animals were euthanized in a bid to limit the spread. The outbreak reached nearly 300 confirmed human infections and 100 deaths. However, in subsequent NiV outbreaks, there were no intermediate hosts. Nipah’s symptoms include fever, headache, drowsiness, respiratory illness, disorientation and mental confusion — and can progress to coma within 24-48 hours. The WHO recommends avoiding contact with sick pigs or bats in endemic areas, as well as not drinking raw date palm sap as precautions against infection.